Even after reading and accepting (albeit provisionally) the foregoing discussion pertaining to the meeting of Psychology and Tarot, the responsible psychotherapist will still properly wonder: How could these spiritually-based, randomly-selected Tarot cards be reliable and valid in psychological treatment? It is one thing to establish a Tarot lexicon based on sound psychological principles, or even stunning metaphysical insights, but quite another to actually bring this arcane instrument into one’s livingroom, much less one’s consulting room. Particularly as the Tarot method requires placing supreme trust in the natural intelligence that collects around sacred or “empowered” randomness, many will feel hesitant, fearing the method’s lack of reliability. Before being sufficiently comfortable to introduce so unorthodox a tool into actual practice, the therapist will need to better understand the mysterious mechanism of its operation. How on earth, she well asks, does it work? Little assurance will be drawn from so unlikely an apologist as Fred Gettings, occult author and compiler of the voluminous Fate & Prediction: An Historical Compendium of Palmistry, Astrology, and Tarot , who himself allows an echoing, if not disconcerting, sentiment: “Although the Tarot method works,” he writes, “it must be admitted from the outset that no one has ever been able to explain how it works [italics mine].”2 Perhaps a more precise summation of Mr. Gettings’ factually correct assertion would grant that although the mechanism behind Tarot has been speculated upon in multiple arcane and exotic ways, from nonlinear postulates of theoretical physics to ancient wisdom myths like Indra’s Net (and everything in between), still no one to date has empirically demonstrated to any satisfaction how or even “that” the Tarot method works. To do so scientifically, one must clearly demonstrate a causal relationship linking method and effect, a linkage that can be repeated under similar conditions by different observers. The inherent problematics of scientific proof for a subjective, invisible, and irregular effect present a real challenge to the would-be Tarot empiricist, much as is encountered with related depth techniques or even in the fierce “brain versus mind” debates brewing in the emerging science of consciousness. It is widely agreed that scientific study is not well-equipped to penetrate the subjective dimensions of the human mind. The problem with classical scientific method when dealing with intrapsychic states is that mental events are not always clearly distinguished, nor are they independent from each other. Subjective effects in some cases are not easily translatable into precise language, nor are they consistently or objectively reported. There is no clear flowing of influence from one event to the next as (allegedly) with outer behavior, and finally, “psychological time” is neither linear nor unambiguous, but irregular, observer dependent, and contextually shaded. All of which makes direct quantification and measurement especially troublesome. Such inherent difficulties notwithstanding, I believe an empirical explanation for the Tarot method can indeed be demonstrated in Jung’s theory of synchronicity. As we suggested earlier, many explorers today believe synchronicity carries the key not only to divinatory practices but to paranormal phenomena and certain anomalous physical phenomena as well. Herein lies a region we may refer to as “metascience,” the study of invisible, acausal, non-linear relationships between inner and outer worlds. As was briefly discussed [in Chapter Four], the term “synchronicity” made its first introduction into the world’s lexicon in 1938 by Carl Jung, in his quite famous foreword to sinologist Richard Wilhelm’s classic translation of the I Ching. For those not familiar with the Book of Changes, it has been without rival the fundamental text of traditional Chinese culture and continues to capture the imagination of intuitively-inclined Westerners today. The text is a divinatory system with 3000 year old roots in the traditions of magic and shamanism. Nearly all that was significant in traditional China–philosophy, science, politics and popular culture–was founded on interpretations and adaptations of the I. The core of the book is considered the oldest and most complex divinatory system to survive into modern times. Examples of synchronistic phenomena are easily illustrated in collective events, as for instance, the Oklahoma City Bombing of April 19, 1995. But first, let’s examine (hypothetically) the more likely cause-and-effect scenario of this incident, which must be ruled out should we find the genuine article. Suppose several research psychologists attempted dream studies in Oklahoma City following the event. They discover significant numbers of subjects reporting dreams and fantasies involving sabotage and destruction, of buildings exploding, of hidden bombs or mass death–that is, dreams occurring shortly after reports of the tragedy. These parallels would hardly be considered ‘synchronistic’ or even ‘acausally-connected’. The psyche of such dreamers has obviously been affected by psychological causes churning throughout local and collective awareness. Anxiety dreams following shocking events of this nature are quite common. To the contrary, after the tragic news one might rather expect a great many people in all parts of the country to incorporate this upsetting imagery in their dreams. We would then obviously rule out ‘synchronicity’ to explain such clearly ‘caused’ correspondences. If, on the other hand, a particular dreamer reports: (1) the same sort of mayhem and destruction in his dream, perhaps with lucid details of the Ryder truck, the screaming panicked government employees, The Murray Building collapsing etc. ; (2) this startling dream occurred on the night preceding the catastrophe; and (3) we can be certain this dreamer bears no possible conscious or unconscious relationship to the conspirators themselves, or has not been made privy at all to their goings on whatsoever; then, (4) it is then safe to conclude that those clamoring headlines discovered on the morning AFTER the event (by said dreamer) must reasonably be considered ‘acausally-connected’ to the dream. This is simply because the actual event for which such dream content was referent had not yet taken place. Of course, the parapsychologist may beg to differ. His argument would insist that a causal exchange did in fact occur: the dreamer was simply prescient, his psychic foreknowledge (precognition) would account for (i.e. caused) the seeming dream coincidence as such. It was simply a case of prescience or clairvoyance; in a manner of speaking, the ‘future’ had caused the dream! It’s simply that we have not yet the technology to measure such invisible forces. Jung himself, with his great fascination for J.B. Rhine’s groundbreaking ESP experiments at Duke in the 1930’s, entertained the impressive parapsychological evidence contributing to synchronistic phenomena. Many in the Tarot community, as well, believe divination to be a psychic phenomenon, with the cards acting as “psychic springboards” or triggers for telepathic, clairvoyant, or precognitive phenomena. Paranormal research, in fact, may one day isolate certain subtle and causal energy fields operating between Tarot cards, readers and subjects, and require major revisions of the synchronicity hypothesis. Suggested in Jung’s theory of synchronicity is the presence of some underlying interior intelligence at work, some non-personal agency of wisdom which purposively guides each individual psyche towards its predestined objectives of balance and wholeness (equilibrium and individuation). Empty of the sentiment that normally muddies human perception, this higher logic flows more like a fresh running river. It is deep and clear, cool and nonpersonal, unfixed and nonlocalized. Though accessed from a mysterious source, it is nonetheless closer to the natural order. It is immune to those arbitrary habits or conventional thinking which, in the final analysis, may rest on no logic at all. For Jung, such transcendent intelligence is viewed as the very matrix from which all psychological development and transformation unfolds; it operates through a system of compensatory self-regulations for the purpose of linking conscious and unconscious worlds with the objective of psychological wholeness. This view is quite distinct from the determinist constructions of evolutionary psychology which place more emphasis on the role of social and cognitive factors of adaptability without reference to teleology. But no matter. In defiance of our reassuring rationality, the synchronistic hypothesis reasserts its ugly head: All energetic exchanges between reader/querent/card are categorically ruled-out and unrelated to the effect! That is, no parlor trick, no clairvoyant reader, no psychological illusion, no misattribution, no projective identification, no accident, no meaningless coincidence, no miracle, and no loaded deck has caused the reading’s accuracy. Indeed, there are NO BECAUSES. To the contrary, one finds instead only the disquieting reminder that the world moves in mysterious ways. Meaning has arrived acausally as a function of the method itself, involving no extrinsic influence whatsoever. Instead, an agent presumably of ‘higher intelligence’ or ‘absolute knowledge’ (at least from our limited vantage points) has delivered the correct cards for this moment much as it delivered the correct dream in all its well crafted complexity last night. 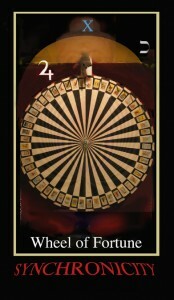 Although in Tarot, unlike the dream, the agent is deliberately called forth. 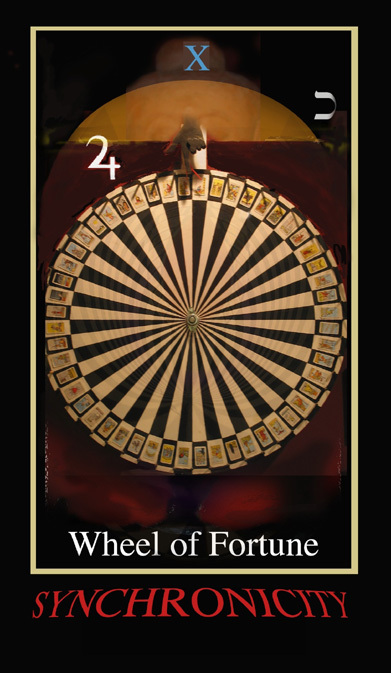 Sagaciously, and in concert with the emotional motivation of the querent, the Tarot method itself creates conditions for the probability of synchronicity to occur. And as mentioned in a previous chapter, psychologists will likely locate this innate, guiding agency as residing within the psyche, while metaphysicians, theologians, and perhaps quantum physicists will place its residence in nature or in god. In the Tarot method, a procedure that intentionally disrupts and confounds linear assumptions, the meaningful coincidence that occurs between cards and querent can not be causally explained, because in the final analysis, there is no conventional causality operating. A linkage between mind and matter, subject and object, has been facilitated by what has been deemed ‘empowered randomness,’ the vehicle of oracularly-intended synchronicity. This phenomenon is likely to be simply an occurrence of nature– related perhaps to “The Force” (of Star Wars fame)–though typically unrecognized due to our vast inculcation of scientific realism and habitual causality. When it occurs spontaneously we deem either fraudulent or else categorize it as “some religious miracle.” Such describes the so-called “apex problem” of the Tarot practitioner, mentioned earlier with Thought Field Therapy. In this case is the Emperor clothed or naked? The scientist is quite right to wonder: Could this synchronistic hypothesis using the Tarot method be demonstrated experimentally? Could it empirically be shown to have practical value and application? Regardless of Tarot’s inherent difficulties with scientific measurement, could a pilot study of sorts be designed to demonstrate sufficient consideration of this approach, in the least to initiate a path of further research and experimentation? The following chapter describes one of several such pilot studies conducted by the author wherein the synchronicity hypothesis was tested. 1 Jung, C. G., ‘On the Nature of the Psyche’. Reprinted in Collected Works Vol. 8; Second edition (Princeton University Press), Ziff, 246, p. 167. 2 Getting, F., Fate & Prediction: An Historical Compendium of Palmistry, Astrology, and Tarot; Exeter, New York, 1980, p. 157. 3 Ritsema, Rudolf, and Karcher, Stephen [trans] I Ching: The Classic Chinese Oracle of Change; Element Books Limited, Great Britain, 1994, p. 10. 5 Jahn, Robert, and Dunne, Brenda, Margins of Reality: The Role of Consciousness in the Physical World; Harcourt, Brace, Javanovich, New York, 1987. 7 Mansfield, Victor, Synchronicity, Science, and Soul-Making, Open Court. 1995, pp. 22-36. 9 Van Eenwyk, John, Archetypes & Strange Attractors: The Chaotic World of Symbols; Inner City Books, Toronto, Canada, 1997, p. 42. 10 Clarke, Arthur, C. quoted in The San Diego Union Tribune [“La Jolla Nobelist rocks the scientific boat”, Graham, David, E.), September 15, 1998, p. A13.